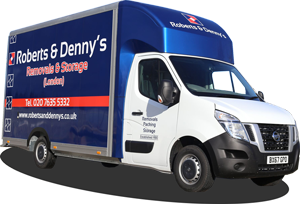 Roberts & Denny’s Removals London are a traditional family based removals & storage company who have been trading since 1930. We understand that moving home can be stressful which is why we go the extra mile for our customers. At Roberts & Denny’s you can count on our 85-years worth of moving experience and professional teams of packers and movers to make your moving day run as smoothly as possible. We operate a fully insured removal and storage service that gives you total peace of mind on moving day. What makes Roberts & Denny’s one of the best removal companies in London? Our expert specialist teams provide efficient house removals, office removals, man and van services, furniture removals, piano removals, storage services, and packing services throughout London. From our headquarters in Peckham, we provide removal and storage services to the whole of London and Greater London. Roberts & Denny’s are long-standing members of the ‘National Guild of Removers and Storers’, ‘The Removals Industry Ombudsman Scheme’ and the ‘Road Haulage Association’. We are dedicated to providing first class services for fair and affordable prices to all our domestic and commercial customers. Roberts & Denny’s operate a large versatile fleet of removals vehicles which gives us the capacity to undertake moves tailored to your individual requirements. At Roberts & Denny’s we also operate our very own ‘Guild Approved’, temperature controlled and secure containerised storage facilities. Our competitive London storage rates allow you to keep your goods safe and secure without breaking the bank! 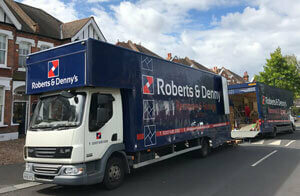 Roberts & Denny’s are a removals firm you can rely on and trust. Our experienced house movers go the extra mile when moving families and businesses across London. From ordering local parking suspensions to finding the quickest routes to your destination, we take into account everything. If the idea of packing up all your belongings seems a little daunting, then speak to us about our packing service. Roberts and Denny’s offer add-on services including professional packers who will wrap and pack up your belongings saving you the task. Our excellent packers will guarantee that all of your items are fully protected during transit and handled with care. Our dedication to providing you with a first class moving experience and professional removal services is unrivaled. Once we have completed your move, we’ll be checking to make sure you’re happy with our service. You’re feedback is essential for us to continue to grow and build upon our well established reputation as one of the best removal companies in London. Please browse our website and check out our free resources which contain plenty of useful information, such as moving day checklists and pricing lists for packing materials. For a free quote use our online estimate form. Simply give Roberts & Denny’s a call on 020 7635 5332 today for further information, or to get a free no obligation quote. Why Choose Roberts & Denny's Removals London?